A few weeks ago you met Paula—when both Judie and Paula sent their bios, I suddenly noticed they were talking about each other! Lots of talent in their stamping group! I have been stamping for 14 years. 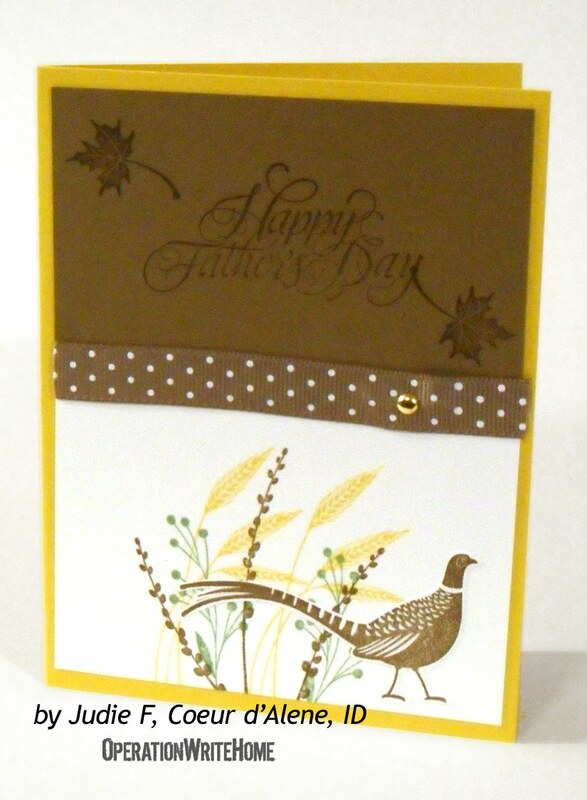 When I retired I began looking for ahobby and was invited to a Stampin Up Party and got hooked. I have a stamp room with wonderful light and everything I need at hand. 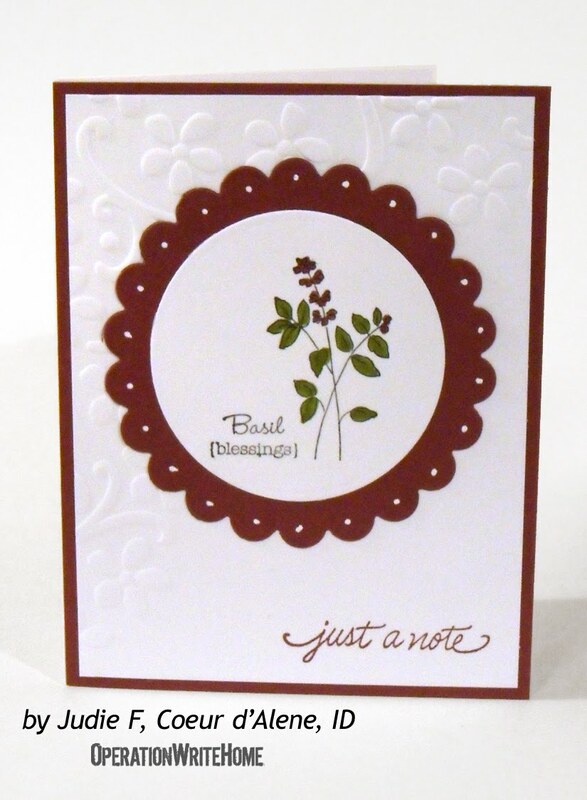 I love embossing folders and the new stampin up clear stamps. I also like copic markers and of course punches. I like to do a variety of techniques but mostly stamping and coloring and using a variety of background papers or embossed cardstock. I love red but try to use bright colors or pastels. 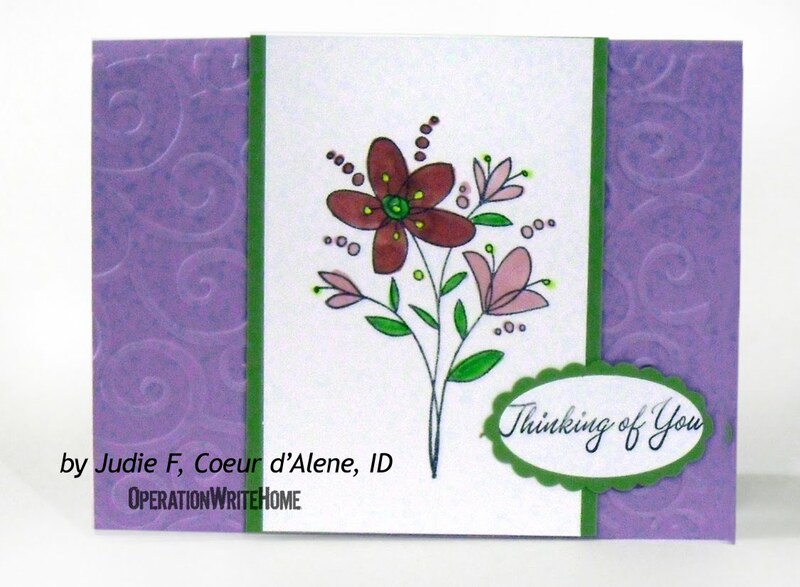 I read about Operation Write Home in Cardmaker and passed the information on to my friends and stamping group.It is such an honor to be associated with such a fine group of people. I am so amazed at the military of this country and their dedication to our freedom and wanting others to enjoy freedom in their countries.I feel it is an honor and a privilege to make cards for them. Their families deserve all our support for all that they give up for us.It is the least we can do. 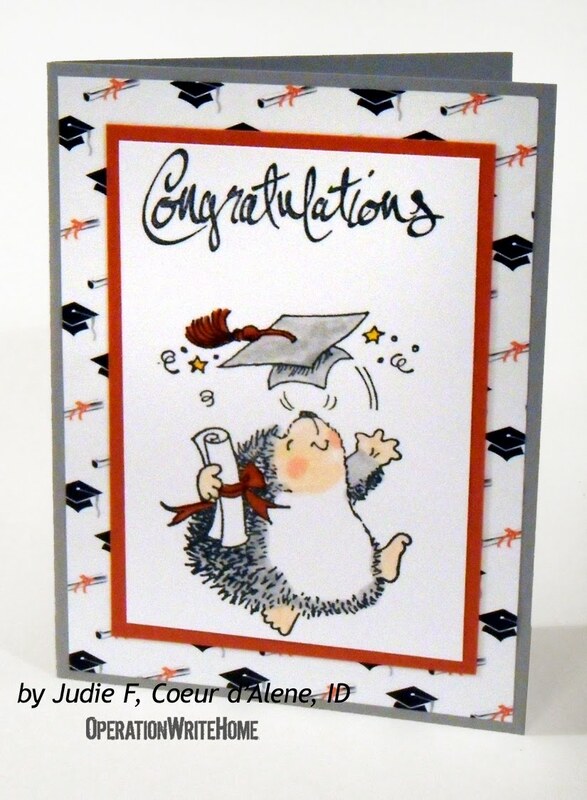 Beautiful card Judie, I love your clean style! Just love your cards. I like something more simple, but these have both style and simplicity!! Keep up the great work! 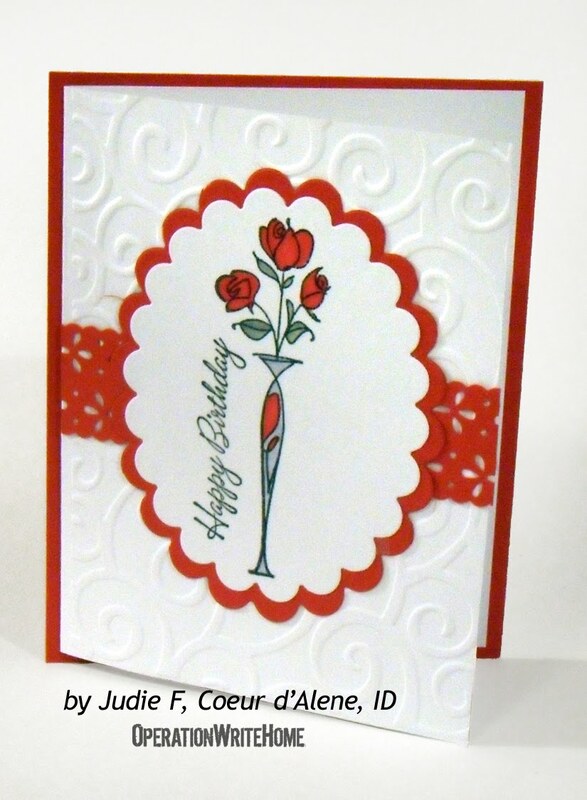 Beautiful cards Judie. 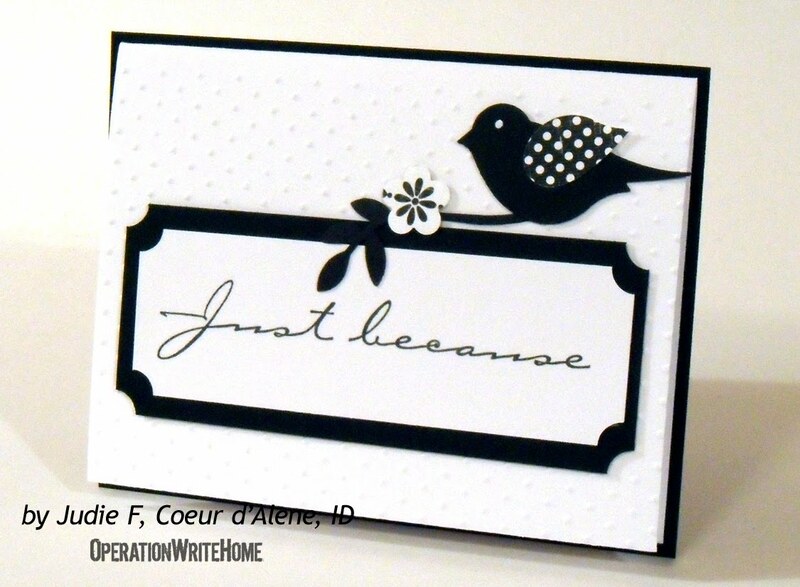 The black & white "Thinking of You" is absolutely striking, I just love the bird, branch and flower detail! Nice to meet you Judie, and your cards are all unique and lovely! Judie! These cards are stunning! I especially like the black and white card. I may have to CASE that one!